This brand-new anthology traces the evolution of Rosanne Cash from a country music superstar to a critically-acclaimed singer-songwriter. In retrospect, one of her very earliest songs, the lovely “Can I Still Believe in You,” from her Germany-only self-titled debut from 1978, sort of separates Cash from the rest of her then-country music peers–it’s as if she strived to be more than just a country star, but an artist who can cut deep with her own style and lyrics. The first disc of Essential contains a slew of her country hits from the ‘80s, marked by her collaboratons with then-husband Rodney Crowell: “Hold On,” the classic “Seven Year Ache,” “Never Be You” and “I Don’t Know Why You Don’t Want Me” could have possibly crossed over into the rock and pop mainstream. But then came the 1990 album Interiors and it represented a leap forward as far as Cash’s stylistic direction– its personal music is represented on Essential through tracks such as “The Real Me” and “I Want a Cure.” From there on, Cash’s music has gone from polished country to a more reflective sound pointing towards a rootsy folk style ( “Seventh Avenue” and “Sleeping in Paris”). Essential closes with a couple of tracks from her most recent album The List, featuring duets with Bruce Springsteen on “Sea of Heartbreak” and “Sweet Memories” with Chris Thile. 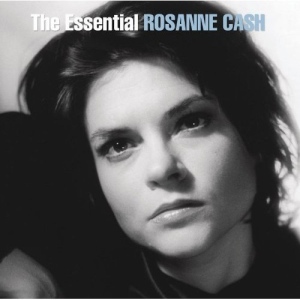 The Essential Rosanne Cash is a terrfic career-spanning look at one of music’s most respected and talented artists.